New King Motor EVO Brushless Electric Buggy. •Huge Powerful 960KV 3500KW 8 Pole brushless motor, Huge 8MM heavy duty steel output shaft HD 8 Gauge Wires. •Motor Type : Sensored / Sensorless Brushless Motor (only in sensorless mode). 4 out of 5 stars - 1/5 Scale King Motor EVO Brushless Electric Buggy HPI Baja 5B FLUX Compatible ! 3 product ratings3 product ratings - 1/5 Scale King Motor EVO Brushless Electric Buggy HPI Baja 5B FLUX Compatible ! Newest & upgraded 1:5 scale 2WD Rovan Baja 5B Buggy 2.4Ghz Radio installed. Parts & components compatible with HPI Baja 5B / 5T / 5SC and King Motor Baja models. Reaches speeds of 40 mph.A great quality 1:5 scale Baja RC Buggy with essential upgrades already added. Newest & upgraded 1:5 scale 2WD Rovan Baja 5B Buggy 2.4Ghz Radio installed. Parts & components compatible with HPI Baja 5B / 5T / 5SC and King Motor Baja models. A great quality 1:5 scale Baja RC Buggy with essential upgrades already added. Protect your engine and carburetor from small debris, dirt and sand. 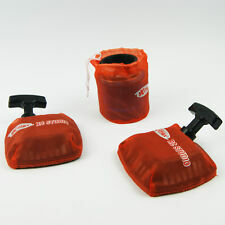 Outerwears are a must if you are planning to run your gasoline powered RedCat Racing 1/5 scale in dirt or sand. You get 2 pairs of pull starter Outerwear and 1 air filter outerwear. Custom made Losi 5T 5th scale rc truck zipper bag. Made from Durable, PVC backed canvas. It has a double gym bag style handle system for easy loading and unloading in and out of your vehicle, or simply just carrying around. Wow Beautiful 1/5 Scale Baja! Ready To Run, Stunning! This is a NEW Genuine HPI 113141 Baja 5B 1/5 2WD Gas Desert Buggy RTR w/ D-Box 2 / K23cc Gas Engine. Part # 113141. Take command of the biggest buggy available from HPI Racing, now fitted with HPI’s exclusive D-Box 2 tech! This is a NEW Genuine HPI Racing 115484 1/5 Baja 5B Kraken Sidewinder X5 Buggy Gas RTR 2WD w/ Radio. Part # 115484. with the Kraken RC Sidewinder X5 Conversion. 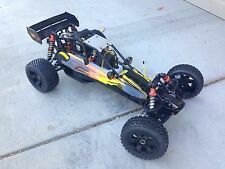 Baja 5B Sidewinder Sand Rail SX5 Buggy w/Kraken RC Sidewinder X5. This is the HPI Baja 5B Kraken Sidwinder X5 Gas 1/5 Scale RTR Buggy. Powerful Fuelie 26S 26cc 2-stroke engine. Fitted with Kraken RC Sidewinder X5 roll cage and pre-painted body panels. Huge 26cc 2-Stroke Engine. Take command of the biggest buggy available from HPI Racing, now fitted with HPI’s exclusive D-Box 2 tech. beast anywhere you go! With a mighty 23cc 2-stroke engine powering the huge, rear-wheel drive Baja 5B buggy, you can easily hit speeds over 30mph. Original HPI Box will be included. Sure to be a collector's item! NOT A CLONE ! I built-up this show truck over the course of 10 years with just about all the popular mods available for the 5T. Experience the Baja 5B like never before—fully loaded and wrapped in a hard-core Kraken Roll cage, just like the full scale racers. HPI and Kraken RC bring you the best of both worlds! 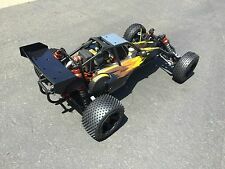 Baja 5B Sidewinder Sand Rail SX5 Buggy w/Kraken RC Sidewinder X5 Conversion. Engine: HPI fuelie K26 2-stroke gasoline engine with pull starter. Clutch: 8,000 RPM with lightweight shoes and heavy-duty spring. Drive: Two wheel, steel dogbones with rubber boots, super heavy duty driveshafts, one-piece rear hub for increased durability. 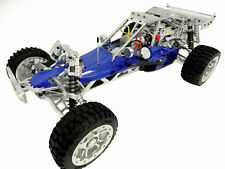 This is the HPI 115484 Baja 5B Kraken Sand Rail SX5 RTR HPI115484 from HPI. Part Number: HPI115484 Manufacturer: HPI. - Engine: HPI fuelie K26 2-stroke gasoline engine with pull starter. - Drive: Two wheel, steel dogbones with rubber boots, super heavy duty driveshafts, one-piece rear hub for increased durability. Max speed:80km/h Power System 29cc single-cylinder air-cooled two-stroke four-point fixed gasoline engine (ROFUN 997 carburetor). Vehicle Type: Rovan Buggy. 1X RC Car(do not included the car battery). Drive:rear whee drive Power System Motor: 29cc single-cylinder air-cooled two-stroke four-point fixed gasoline engine. Compatible with Baja rc car parts,only the chassis,Fuel tank, roll cage and others cannot use. HPI RovanKing MOtor Baja 5B 5T SC SS. Include a whole kit as the photo 1. STILL USING ORIGINAL 4mm BAJA 5B SHOCK; LEAKING SHOCK; BROKEN SHOCK SHAFT; TORN RUBBER BOOT - NOW JUST REPLACE THEM WITH THIS VCC/HD 6mm SHOCK SHAFT UPGRADE KIT. TAKE OUT YOUR OLD SHOCK SHAFT AND SCREW IN THIS NEW 6mm SHOCK SHAFT. Engine & Gear Guard for HPI Baja 5B 5T SC. Prevents dust and dirt from getting into the car. Consist of ( does not include the 5T Under Guard). CNC ALLOY CARB ADAPTOR ISOLATOR BLOCK WITH HIGH TEMP COMPOSITE FIBRE GASKETS. FOUND ON HPI BAJA 5B, 5T, SC, FG, KM AND OTHER 1/5, 1/6 BUGGIES AND TRUGGIES. MOUNTING HOLES 31MM APART SUITABLE FOR ALL WALBRO WT SERIES OF CARB. For HPI Baja 5B 5T SC, King Motor and Rovan Cars. Length - 1m (39"). Also for Marine Gas Boat Fuel Tank. For HPI Baja 5B 5T SC, King Motor and Rovan Cars. Inlet Fuel Line for Gas Fuel Tank. Also for Marine Gas Boat Fuel Tank. Runs on pump gas. 1/5 scale this thing is huge. pick up only in central NJ. never ran it. New Bright Rc Baja Buggy 15 for parts only. Condition is Used. Body has a crack. Shown in the photos. 14" long 6" wide. 29cc single-cylinder air-cooled two-stroke four-point fixed gasoline engine (ROFUN 997 carburetor). Rovan Q-Baja Rc Car 1/5 RWD 29CC Gas 2 Stroke Engine Buggy,not included. Rovan Baja 305 Rc Car 1/5 RWD 30.5cc Gas 2 Stroke Engine RTR Buggy,not included. To find a compatible RC, search for "Kid Galaxy My First RC 49 MHz". Easy-to-use RC car toy for toddlers. Squeezably soft toy car for your child's safety. Absorbs impacts and won't mar your furniture. 1/5 scale 36cc Rovan Sport 360B Special Edition Baja Buggy only available from Rovan RC with extra upgrades installed! Rovan 1/5 Scale 36cc 360B Full Aluminum Gas Powered Special Edition Baja. Powerful 4 bolt 36CC 2 stroke (gas and oil mix) RovanSport engine with Easy Pull Start System and Walbro 1107 Carburetor. With the Kraken RC Sidewinder X5 Conversion. HPI Vehicle Parts (207). Baja 5B Sidewinder Sand Rail SX5 Buggy w/Kraken RC Sidewinder X5. HPI Baja 5B Sidewinder Sand Rail SX5 Buggy. Engine: HPI fuelie K26 2-stroke gasoline engine with pull starter. 29cc single-cylinder air-cooled two-stroke four-point fixed gasoline engine (ROFUN 997 carburetor). 1X Rc Car(included the car battery). 3.6mm shock absorption, 8000 rpm clutch, second generation reinforced front and rear suspension.